Aconcagua Polish Glacier route. Trips and expeditions to Aconcagua, the summit of South America: Polish glacier Route. The seven summits, the highest peaks of the 7 continents! Trips, Statistics & information! Below is the information about our Polish Glacier route program; Check here for the prices and dates. Please also read the FAQ about the Aconcagua trips about what's included etc. Dates & Prices Normal route Polish Traverse Polish glacier F.A.Q. 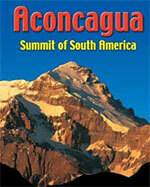 The normal routes on Aconcagua can be climbed without any technical experience, but should not be underestimated. General mountaineering experience is certainly needed to avoid injury or death, even on the "Normal route". For the first time we also offer the more technical Polish Glacier route, and ascent using the beautiful glacier ending right below the summit. On our Polish Glacier approach route you will ascend slowly. This route follows the Polish Traverse Glacier route until the beginning of the glacier, and goes right up! This means you will be able to enjoy the more wild and remote Vacas valley (less than 15% of the climbers use this route, 85% use the normal route! ), but do need crampons ice axes, technical mountaineering experience etc. This route is recommended for it's beauty and versatility and a great way to climb technical ice at 6000+ meters. We use one guide for max 2 persons, but you can come with a bigger group of course, we will just use more guides. Transfer to the Hotel. Lodging. 02 Mendoza / Puente del Inca (2725m). Procure of permits. Welcome lunch. Transfer to Puente Del Inca. Lodging in hostal. Dinner. 03 Puente del Inca / Pampa de Leñas (3100m). Transportation to the Quebrada de Vacas. Beginning of the trekking to Pampa de Leñas. Camp. Dinner. 04 Pampa de Leñas / Casa de Piedra (3600m). Trekking to Casa de Piedra. 05 Casa de Piedra / Base camp Plaza Argentina (4000m). Trekking to the Plaza Argentina base camp. Camp. Dinner. Resting day in the Plaza Argentina base camp. 07 Plaza Argentina / Camp 1(4950m) / Plaza Argentina. Transportation of material for the altitude to the camp 1, and return to Plaza Argentina. Resting day in Plaza Argentina. 09 Plaza Argentina / Camp 1 (4950m). Climb to Camp 1. Camp. Dinner. 10 Camp 1 / Camp 2 (5800m) / Camp 1. Resting day in Camp 1. 12 Camp 1 / Camp 2 (5800m). 13 Camp 2 / Summit (6962m) / Camp 2. 16 Camp 2 / Plaza Argentina. Descent from Camp 2 to base camp. Dinner. 17 Plaza Argentina / Pampa de Leñas. Descent from Pampa de Leñas to Quebrada de Vacas. Transfer to Mendoza, lodging in Hotel (B&B, no dinner). Bookings: email us for bookings or special requests!